Who doesn't like a good piece of meat? How about 82 packs of beef, weighing 111 pounds? That's about what you get when you order a 1/4 cow from Cloudland Farm, located in Pomfret, VT about 10 minutes north of Woodstock, VT. 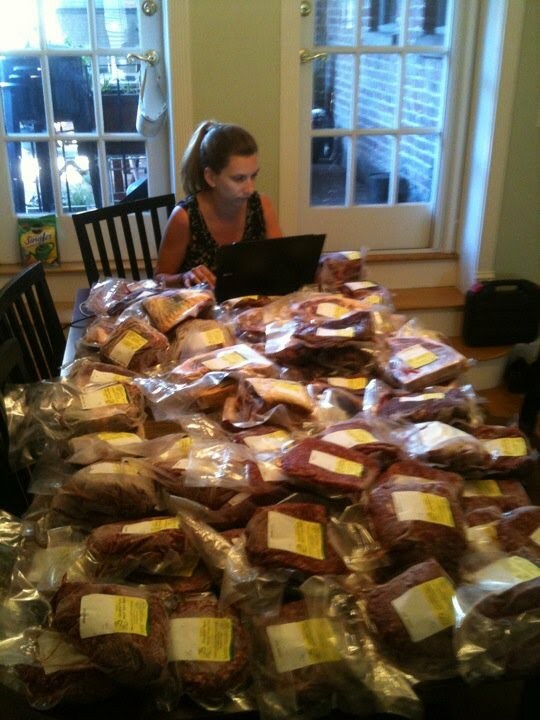 Here's a picture of Lisa helping me inventory our meat! What's so good about grass-fed beef? For one thing, grass is what cows normally graze on (not corn, which is cheaper, and makes cows fattier). Each cow is dry-aged for two weeks, cut, then immediately vacuum sealed for freshness. Most importantly, it just flat out tastes better - and costs only a little more than you'd pay in a grocery store at home. Our 1/4 cow cost about $520. Split it with some friends to try out first - you'll be glad you did! Tell Cathy we said hi too! She's also starting farm dinners, which we're dying to try out!